Growing up, California native Jill Thomson was surrounded by art. Her grandmother was an artist and her father did interior design. As a teenager, she was the only girl in her group who preferred reading Architectural Digest over Seventeen Magazine. As a university student, she worked in her father’s Summerlin furniture showroom, learning the roles of furniture buyer, showroom owner, and interior designer. Today, she has her own design studio in Las Vegas, her new home. And she does design and building projects for high-end clients throughout the country, whether for their homes or businesses. In 2012, the luxury lifestyle Diamond Cake Magazine included a write-up of Thomson. She is often quoted in interior design features in the Las Vegas Review Journal. In Bellacere, the luxury neighborhood just minutes from The Strip, Thomson’s patterns featured an elegant music room with arched entrances and exposed beams. A winding staircase is elaborately decorated with a dark wood rail. For an Anthem Country Club remodel, she used white walls and light paint to make the furniture stand out. A new kitchen with mixed metals and natural wood floors has discrete shades of gray, white and taupe. And Thomson’s admitted obsession with lighting fixtures is seen in her layout for a new luxury home in Altura. A custom-built chandelier, visible to the first and second stories of the home, is six feet tall and has three tiers. Hand-carved, the chandelier is decorated with semi-precious rock crystals. More custom lighting went into the master bedroom, where Onyx was blended with crystal to create a lighting fixture unlike any other in the home. If designing even a temporary home for a Hollywood idol means you’ve made it to the top, then Marteen Moore should not doubt her merit. A project she is most proud of is having remodeled the home that Robert DeNiro slept in as he filmed the movie Casino. The Vegas-based designer was born and raised in Southern California. A feature on Moore in Las Vegas Woman described how her “fearless female” philosophy kept her going, even after suffering a paralyzing injury. Her designs are sought-after by the ritziest clients in Henderson, North Las Vegas, Paradise, Spring Valley, Summerlin, and Sunrise Manor. They’ve also been featured in national home design magazines, such as Better Homes and Gardens, House Beautiful, The Robb Report, and by Nevada’s local press. Moore’s skill with concept-to-completion projects can be seen in a custom home in Vegas. Her design of the transitional residence has a mostly neutral-toned great room with splashes of color, floating chair halves, and intimate seating for eight. The fireplace is two-sided; it’s flanked by six-sided art displays put there to connect the room to a staircase. The kitchen’s elegance comes from glass mosaic backsplash, organic metal accessories, high-end stainless steel appliances, and a sink mounted beneath an island. Exterior doors were made to disappear into the walls, and a custom-built gate is fortified with copper, iron, and stainless steel. For a home tucked into hills by the Ridges, Moore used stone on the floors and backsplashes for a contemporary kitchen look. And the entrance, too, speaks elegance: an oversized door made of stainless and pivot glass repeats the pattern in the windows on top. Interior design projects by Elizabeth Stefanich can run up to $4M. The services provided by this firm, which Stefanich founded in 2004, include but are in no way limited to site inspection, millwork design, space planning, vendor management, and construction coordination. But the heart of this highly acclaimed design firm are cutting edge designs that its owner promises to be on time, on budget, and “without compromise to the creative approach.” Certainly, the certifications and awards speak for themselves. 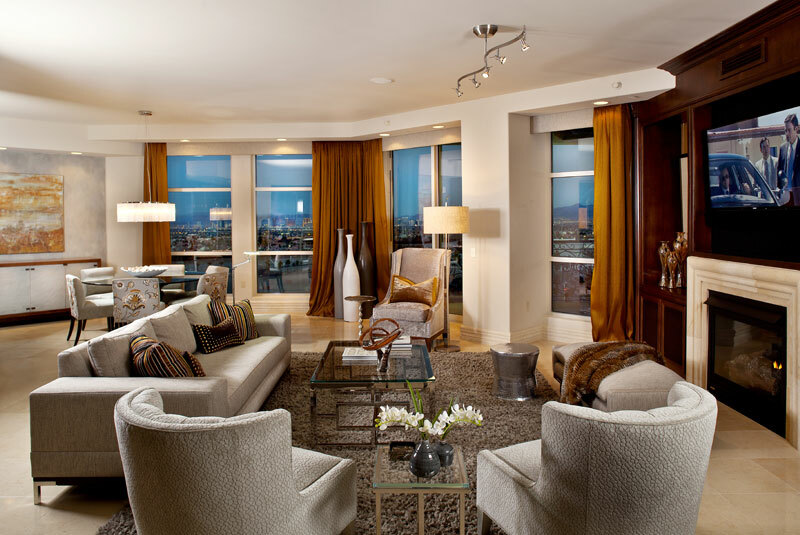 Stefanich is affiliated with the Interior Design of Las Vegas. She covers Vegas areas of Henderson, Summerlin, Blue Diamond, and Mount Charleston, but she has also worked in California, Florida, and Michigan. The testimonials of E Design’s clients praise her for refining her personal style to fit the client’s taste. Projects by Stefanich show that she is comfortable with many design styles. For a contemporary Vegas home, she chose artwork, wall coverings, and custom furniture that blended with the client’s personal color preferences. Another homeowner, at Country Club Hills, needed extensive home remodeling to be completed while she was out of the country for six weeks. The project, which required gutting a master bath and kitchen and all flooring, was finished one day before the client returned. For a home at the Spanish Trail Country Club, the owner wanted a look that resembled her home in Hawaii. Stefanich chose travertine slabs for the fireplace and — to channel the ocean — blue silk for the drapes. American Walnut was the theme of a living room remodel for Midwest clients new to Vegas. Stefanich started with walnut in the floors and wood beams, and she finished off with walnut planks built into an entertainment wall. Peggy Scinta is known to fans of HGTV’s Brother vs. Brother, as the interior designer’s work was featured in Season 4 of the popular TV series. Scinta moved to Vegas over one decade ago. She hails from New York, the home of her first design firm, “Scheme Dreams.” Before owning her own studio, she’d spent more than 15 years honing business management skills as a corporate senior manager. After three trips to Vegas, she decided on Sin City as the location for Scinta Designs, which has risen to the top of the Southwestern design market. Not only has Scinta been selected to design homes for Vegas celebrities, she also was tapped in 2008 to design the green room when MGM Grand hosted the awards show for the Academy of Country Music. In 2013, Scinta was named “Interior Designer of the Year” by the Las Vegas Design Center. The project that crowned Scinta as Designer of the Year was her complete remodel of a home that needed to reflect the globetrotting lifestyle of a successful young bachelor. That mean designing an outdoor sunroom to open up, adding more floor space for the great room. For a modern kitchen, Scinta mixed brushed copper and nickel with custom wood cabinets. The masculine aura stopped at a guest bedroom upstairs, which needed a feminine feel for the client’s mother. Throughout the home, Scinta’s smart choice of patterns, vibrant colors, and rich textures provided harmony and crisp lines. The home’s appeal, said the competition judges, was “timeless.” Another of Scinta’s much-publicized projects was the mid-century ranch remodel featured on the Brothers TV show in 2016. Highlights were bright orange and red front doors, a modern eating area with pendant lights and an aqua wall adjoining light walls to emphasize the warmth created by light wood flooring. Based in Long Beach, California, Inovus started as an interior design and graphic firm in 1990. Today, it is still run by famed Principal Karen Steuben-Dunbar, but it offers much more: concept-branding, programming, space planning, inventory, schematic design and development, construction documents, cost coordination, procurement and installation, and project management. Dunbar has assembled a team of accredited designers, architects, and engineers that works out of locations in Los Angeles and Atlanta, Georgia. Although much of the firm’s work is in Long Branch, Dunbar has ventured out to Las Vegas, where she’s become known for elaborate remodels on oversized custom-built estates in the most exclusive neighborhoods. Inovus has been honored with numerous write-ups in leading design magazines, with awards from the Los Angeles Building Council and the Los Angeles Conservancy, and with front-cover features in Luxe magazine. Inovus showed its skill with modern-themed estates in its layout of the Greenspun Residence in Henderson. Art deco murals pop up in halls and rooms, oversized glass expanses dominate great rooms, and steel staircases wind through a foyer. The recessed lighting and abstract art strung up in long halls give the home a museum-like aura. But few projects can top Dunbar’s extravagant work on the Shier Residence. This French-style chateau covers 16k square feet and sits on 2.5 acres. It’s noteworthy among remodels for meticulous attention to detail. There are vibrant flower arrangements and antique sofas. Kitchen floors are made out of reclaimed and distressed chestnut wood. Bedding was custom made by Greg Paris of Parres Drapery. Rugs were custom made out of wool and silk. Paintings by renowned Buenos Aires artist Aldo Luongo hang in the living room. To create an old world look in one room, Steuben created beams out of wood collected from a west coast wharf. This project made the cover of Las Vegas Home & Design. Jane Cunningham’s clients say that she creates magic. And those clients are not everyday folks. They’re CEOs of Fortune 500 companies, entertainers, industry executives, and even celebrities that Cunningham’s design prowess has turned into followers since she founded Room Resolutions in 2004. Cunningham runs her internationally acclaimed luxury design firm with daughter Amanda, who earned a master’s in design management from Savannah College of Art & Design. The mother-daughter duo take their high-end clients from concept to completion on new home design or redesign and renovation. In 2016, Room Resolutions was honored with ANDYZ Awards from the Las Vegas Design Center for “Multiple Commercial Spaces” and “Individual Commercial Design.” Cunningham’s projects have been noted in numerous publications, including Architect Magazine, The Las Vegas Journal and Luxury Las Vegas. She’s also been profiled by online magazine, California Home & Design. A Palm Greens estate near Red Rock National Conservation area received a transformation by Cunningham that was featured in Architect Magazine. In disrepair for at least two years, the 19k-square-foot property needed the help of 27 contractors, all managed by Cunningham. Over a three-and-a-half-month period, Cunningham designed 11 bedrooms, 13 bathrooms, a guest casita, a ballroom, an eat-in kitchen, four bars, two saunas, two steam rooms, a workout room, a theatre, two dining rooms, a grand entrance, a parlor, a home office, and a formal living room. Modern Zen was the design style for another home in Vegas completed in 2014. To create a relaxed space for a recently retired couple, she pulled out a tub that was never used and replaced it with a walk-in shower designed with Delray panels and natural bamboo. There was a bamboo effect to the rectangular tiles that Cunningham decided to place vertically and adjacent to glass and stone mosaics for an interesting effect. Completing the functional and clean look, she used a Silkroad travertine counter and a vanity with a double stone sink. After graduating from the prestigious Parsons School of Design in New York City, Cary Vogel headed straight for the Gold Coast of Long Island, where he started as an associate and ended up a partner. He became known for eye-popping designs of homes lining the North Shore, as well as in Manhattan, St. Croix, and Florida. By 1988, had his own firm in New York but decided to make Vegas his home. His name speaks volumes in interior design circles on both the east and west coasts. A sampling of his awards includes: the 2010 NAIOP for “Best Corporate Interior,” the Las Vegas Design Center’s 2012, 2013, and 2016 awards for “Best Interior Designer in Las Vegas,” the ANDYZ award in 2016 for “Best Multiple Residential Space,” and the IDS award in 2016 for “Designer of the Year.” Needless to say, Vogel’s work has appeared in numerous publications. Private residences by Vogel in Las Vegas feature Asian-influenced media rooms, autumnal bedrooms, pool house kitchens, and mid-century bedrooms. His “fantasy dining room” showcases a chandelier made from clustered crystals suspended on long strings. A highrise residence has a contemporary-themed great room, a glam office with driftwood accents, and a monochromatic bedroom with a stunning view of the Strip. For an estate in the Vegas Ridges, Vogel’s layout incorporated furniture and artifacts collected by the owners. He chose to blend different patterns and textures with warm colors in a breakfast room that has Queen Anne chairs, steerhide rugs, and a table by Warren Platner. A cocktail table was made out of a vintage Louis Vuitton trunk. A flat-screen TV is hidden behind the mill work lining the fireplace. And the chef’s kitchen features light cream cabinets against tobacco-colored walls, a glass mosaic backsplash, and dark wood floors. Joanne Lucia, member of the American Society of Interior Designers (ASID), so values her client’s privacy that she almost never gives out details of the masterful designs she’s made for them. But there’s no hiding her stellar reputation in Vegas and places like Beverly Hills. She’s been in business for 45 years and works nationwide. A consummate professional, she even reads, interprets, and designs from architectural blueprints. In Vegas, her recent projects have been clustered around Paradise and Summerlin communities. Joanne earned a bachelor’s in professional arts from Woodbury College and another bachelor’s from Pepperdine University. Her work was mentioned in “Who’s Who in Interior Design” by Barron. She is a professional member of the American Society of Interior Designers, and her cutting edge designs have fetched many awards, but even those are kept private. Lucia’s renovation of a contemporary estate in Spanish Trails follows a deep color palette inspired by the abstract painting that takes center stage in a great room. Her interiors for a traditional Bellacere custom home brim with bold elegance. A parlor – too formal to be called a living room – shows richness and history with antique chairs and intricate patterns sculpted into a black wood fireplace mantle. Although the design does not take risks, there is nothing common about it. Dining chairs are cushioned in plush red velvet and stand on top of a gold and red oriental rug. Marble floors and gold wall coverings run throughout foyers and spill into halls. Beds are decorated with piles of gold-tasseled and gold-trimmed pillows in all sizes and shapes. And the foyer area leading into a music room is as exquisite as any you’d find in a French palace. Principal Jill Abelman spent over 20 years working for other interior design firms when she decided in 2004 to open her own. She and husband Marc founded Inside Style, and since then, she’s garnered a reputation that few in the high-stakes field of interior design ever know. Abelman supplies what she calls “turn key” services for luxury homes and second homes of clients out of state. Abelman studied at the Interior Design Institute, then spent several years as a project manager for the prominent Ryan Young Interiors, a California design firm. She spent the next five years as vice president of merchandising for nationwide home builder Richmond American Homes. Her projects grab the attention of interior design experts throughout the country and are often featured in luxury magazines. A kitchen makeover by Abelman was featured on Martha Stewart’s online magazine. For an estate in the Southern Highlands, she was commissioned to design interiors of a 14k-square-foot, completely empty residence. She chose a traditional look that complemented the client’s preference for warm colors and love of Art Deco. But few projects can match her design of a 5,147-square-foot “Sky Suite” that made up three stories. The $4.5M luxury suite was owned by clients who wanted Abelman to create a “sense of home.” She complied, with a colossal terrace and floor-to-ceiling glass panes. Colors and textures were intended to imbue the Vegas nightclub experience. That meant azure, sapphire, and sky blue tones to bounce off the glistening light fixtures. Deep chocolate and slate gray appears in furniture, wood, and granite. A carpet in the master bedroom was custom dyed to arrive at a perfect balance between black and gray. In the kitchen are three crystal light fixtures, a wine chiller, and a ceiling insert fashioned out of hand-crafted mosaic glass. Years from now, students of interior design will study Roger Thomas’s sketchbooks, perhaps hoping the intricate diagrams will inspire them with his genius. That is the word so often used by design aficionados when referring to Thomas’s world-famous creations. He is said to have transformed the design industry, largely because of the masterpieces he’s shaped for Wynn Hotels and Resorts, where he is head of design. Four times, Thomas has been a member of the Architectural Digest 100. His other milestones include being inducted into the UNLV Hall of Fame, being named “Design Icon” for his work on the World Market Center in Vegas, and receiving the “Excellence in Design Award” from the Interior Designers Institute. Thomas also serve as a Founding Trustee on the board of the Smith Center and is a creative partner at Quintus, a new luxury furniture brand based in Los Angeles. He also makes his home in Las Vegas, in Marin County, California, and in Venice, Italy. Few in the design field would dispute that Thomas’s work exists in a genre of his own making. Although most of Thomas’s work is to dress up Wynn’s remarkable hotels in Las Vegas and China, he does dabble in designing private residences. And in that sector, his singular achievements are having designed the Vegas mansion and New York pied-a-terre of Vegas casino mogul Steve Wynn. The Vegas residence is a villa sitting on a golf course owned, of course, by Wynn Las Vegas Hotel. It is said that Wynn wanted the interiors to reflect his monumental art collection. Ivory sculptures greet visitors ascending an ivory staircase with gold handrails. Original Picassos appear side by side over a chic eating area, and a pool has been built into a balcony with unmatched views of the Strip. More bold art floods Wynn’s New York pad where, prevailing over a red-glazed console with a stand that mimics stacked books, is the now-famous portrait of Wynn by Andy Warhol.